Mineral resource management: Where does Vietnam stand? (VEN) - Vietnam Chamber of Industry and Commerce (VCCI) and the Ministry of Natural Resources and Environment jointly organized a workshop titled “Extractive industry governance: Where is Vietnam standing?” on October 8. (VEN) - Vietnam has made great efforts to restore its forest ecosystem in order to ensure sustainable economic development and respond to climate change. (VEN) - Many countries in the world have paid special attention to combining efforts to promote economic growth and protect the environment. Clean, environmentally friendly technological solutions have become the choice of industrial production groups and businesses. (VEN) - Promulgating a national action plan on air pollution control and reducing particulate pollution are just a couple of priority solutions proposed by the Ministry of Natural Resources and Environment to control and reduce air pollution. (VEN) - Since participating in the Montreal Protocol, Vietnam has achieved remarkable success in gradually limiting the use of substances that deplete the ozone layer. 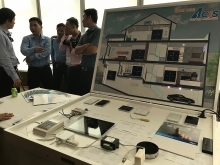 (VEN) - At a Vietnam - Japan disaster prevention seminar recently held in Hanoi, a series of major Japanese technology companies such as NTT Data Corporation, NEC Group, Fujitsu, Panasonic, and SEC Group (SEC) introduced technology solutions to support disaster forecasting via timely and effective collection and processing of information. (VEN) - One of the most urgent problems faced by Vietnam's environment today is how to promote the conservation and sustainability of biodiversity. (VEN) - Minister of Natural Resources and Environment Nguyen Minh Quang directed the Vietnam Environment Administration to accelerate the adoption of amended Environmental Protection Law for a submission to the National Assembly. (VEN) - The farming sector is strongly affected by climate change and is also the cause of greenhouse gas emissions. Therefore, the government and relevant ministries have paid special attention to measures in response to climate change for this sector. (VEN) - Due to increase in population as well as loosely managed exploitation of mineral resources, Phu Tho Province is facing problems of environmental pollution. Therefore, in the coming time, the province will focus on addressing emerging issues of environmental pollution.